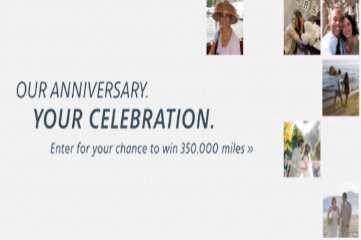 American Airlines ‘Miles for Milestones’ Sweepstakes – Win 350,000 American Airlines AAdvantage miles! Win 350,000 American Airlines AAdvantage miles (35 winners)! ENTER SWEEPSTAKES HERE – American Airlines Sweepstakes page. ENTRY LIMIT – Limit: entrant may enter Sweepstakes up to two (2) times during the entire Promotion Period. ELIGIBILITY – Sweepstakes open to individuals legally residing in the fifty (50) United States and the District of Columbia who are at least 18 years of age (19 in Alabama and Nebraska) or older at the time of entry. SWEEPSTAKES ENTRY PERIOD – “The American Airlines ‘Miles for Milestones’ Sweepstakes” commences 12:00:00 p.m. Central Daylight Time (“CDT”) on April 29, 2016, and ends 12:00:00 p.m. CDT on June 1, 2016. PRIZES – Thirty-five (35) Prize Winners will each receive three-hundred and fifty thousand (350,000) American Airlines AAdvantage® miles, which may be used for air transportation on American Airlines or its “Airline Associates” (American Eagle® service, oneworld® airlines or select AAdvantage® participating airlines), car rentals, hotel stays and other awards available at AA.com/redeem, the (“Prize(s)”). Approximate retail value (“ARV”) of each Prize : $6,965.